Oh, the things people do for the sake of science. A wildlife director named Paul Rosalie volunteered to enter (read: be swallowed) an anaconda for a Discovery Channel TV special called Eaten Alive. 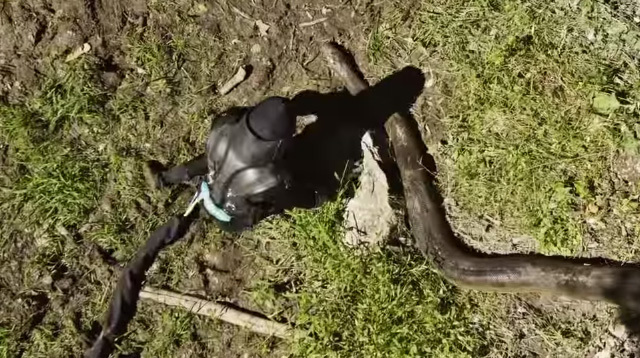 Wearing a snake-proof suit, the daredevil offered himself as bait to the largest snake in the world. Based on the trailer, Paul’s suit will be attached to a rope, which his team will use to pull him back out to safety after he lunges head-first inside the snake. For how long? We can only guess. At this point, we’re still trying to figure out how he can possibly make it out alive and unscathed! Eaten Alive is scheduled to premiere on Discovery Channel on Sunday, November 9. Watch the trailer below!